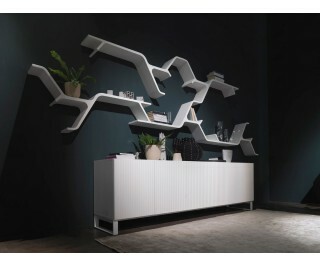 Shelf made from high density expanded polyurethane, injection moulded and spraypainted. The shelf has two holes for wall-mounting with galvanized eccentric pins, 12 mm in diameter. The caps for covering the holes are glued to neodymium magnets which attach to the head of the pins. Template provided for positioning the shelf on the wall.